While cloud environments bring agility and cost savings, working in hybrid cloud and multi-cloud environments creates new data siloes for IT teams to overcome. Striim enables fully-connected hybrid cloud environments via continuous real-time data movement and processing across on-prem data sources and a wide variety of cloud services on Microsoft Azure, AWS and Google Cloud platforms. With in-memory stream processing, Striim allows you to store only the data you need in the format you need. Striim automates and simplifies streaming data pipelines for cloud environments. With its non-intrusive change data capture feature, it extracts real-time data without slowing down source transactional databases. In addition to enabling cloud migration with zero database downtime and zero data loss with real-time cloud migration monitoring, Striim feeds real-time data with full-context – ready for rich analytics on the cloud – by performing filtering, transformation, aggregation, and enrichment on data-in-motion. Striim delivers real-time data to Microsoft Azure, Amazon, and Google Cloud. 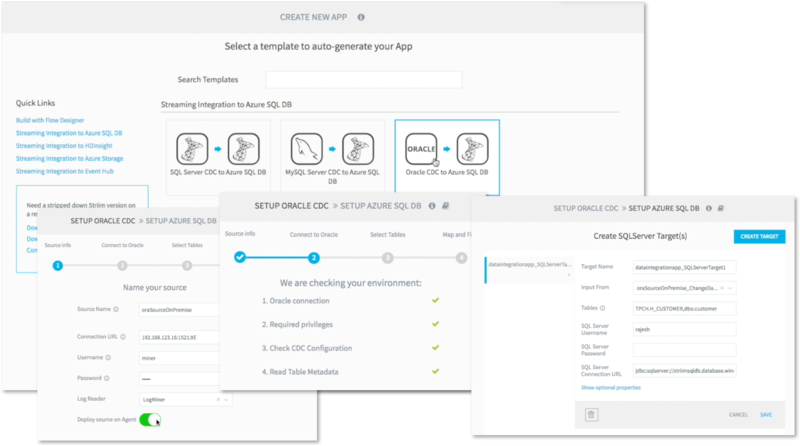 It can run on-premises or in Azure, AWS, and/or Google Cloud as a subscription-based service allowing a flexible data management architecture. This leading courier company in Europe embarked on its cloud journey with the help of Striim. The company is moving its data warehousing and analytics solutions to the cloud, and uses Striim to move real-time data from transactional systems running on Oracle databases to Google BigQuery to enable cloud-based analytics. Google BigQuery serves as the operational data store supporting real-time reporting and ad-hoc queries. The company plans to use real-time transactional data for fleet optimization and real-time shipment status notifications to customers. Striim continuously ingests real-time data from heterogeneous sources including transactional databases via non-intrusive CDC, log files, messaging systems, and IoT sensors. It performs filtering, transformation, aggregation, enrichment, and analytics on data-in-motion before delivering to cloud and other targets. Striim also offers real-time data pipeline monitoring and alerts via interactive dashboards.